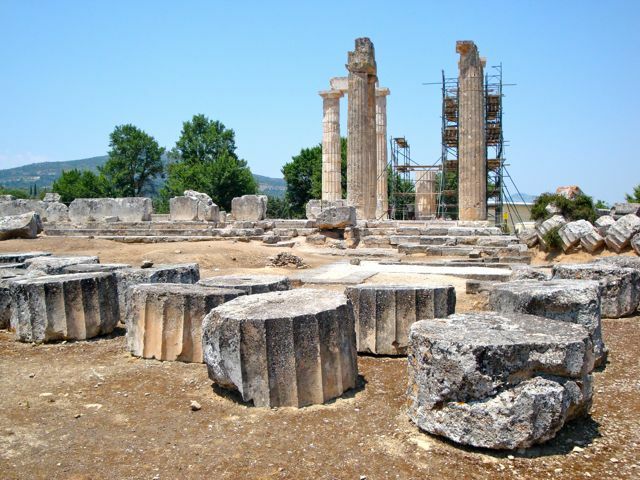 Just beyond Corinth on the E65 which goes to Tripolis is the town of Nemea with the ancient site dedicated to the games that were held in the honor of Zeus whose 4th Century BC temple still has three remaining columns and several more on the way to being reconstructed. The site is being excavated by Stephen Miller of the American School of Classical Studies along with the University of California at Berkeley. There is also a stadium and an excellent museum built by the University of California to house the many findings at the site and to use as a study and research center. Nemea was famous in Greek myth as the home of the Nemean Lion which was killed by the hero Heracles. Now the area is famous for its wines and there are a number of wineries that you can visit. Just look for the signs that have hopefully not been defaced by Argos 13 enough to render them unreadable. Founded by the Dorians, the city of Argos is in a fertile plain at the foot of Mount Chaon and is the oldest continuously inhabited city in Greece. Argos is the agricultural and commercial center of the prefecture, famous for its citrus orchards. Unfortunately most of the ancient past is buried under the modern town, but the archaeological museum on the town's impressive main platia is worth stopping for. 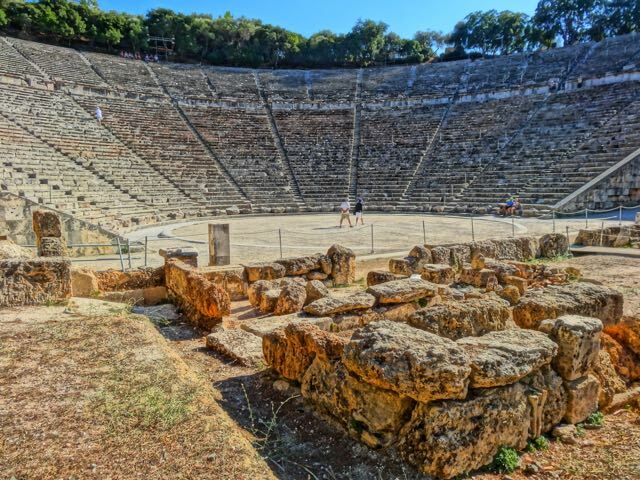 The ancient theater is the most popular tourist attraction in the city and is bigger then the theater at Epidavros. Nearby are the Roman baths and the remains of a first century indoor theater. Above the theater is the site of the ancient acropolis, with fortifications that have been added to by the Byzantines, Franks and the Turks. 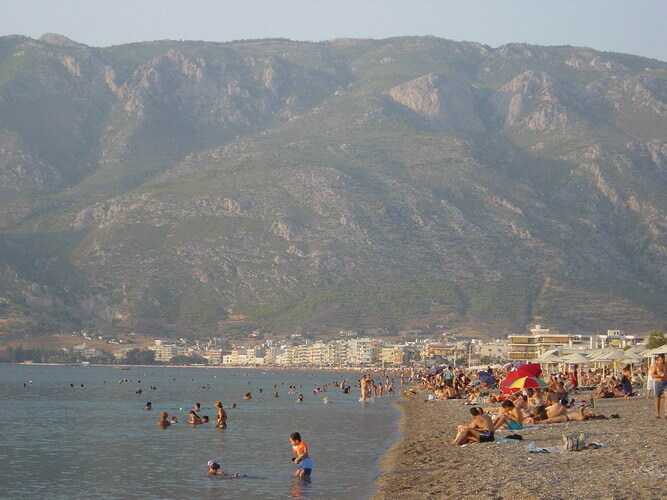 There are buses every half hour to Nafplio, hourly buses to Athens and six buses a day to Myceneae. Northwest of Argos is the Citadel of Larissa with it's Frankish and Venetian fortress and spectacular view. 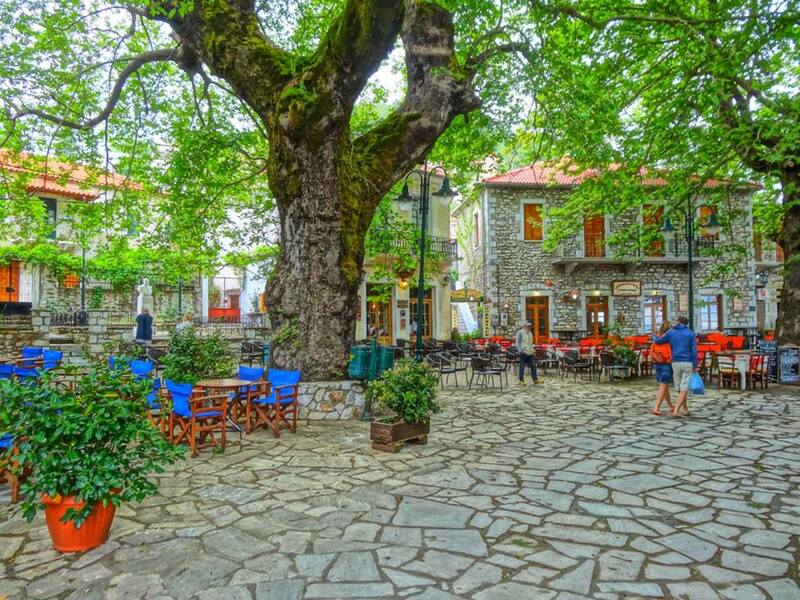 South of Argos are the springs of Kefalari an area of large shady plane trees, running water and tavernas. 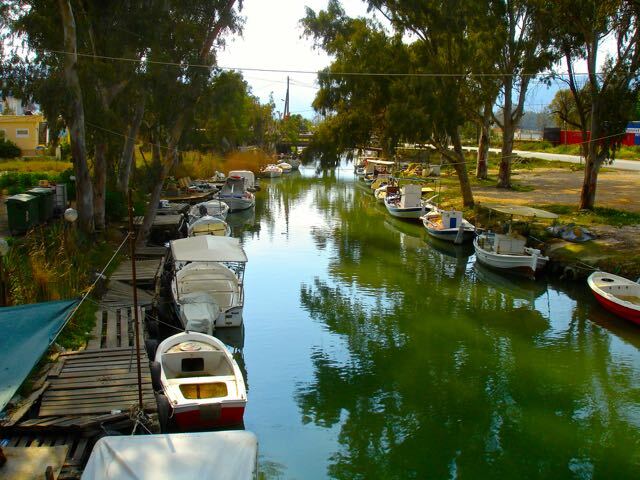 Be sure to visit the town of Nea Kios on the bay near Argos at the delta of a small river where the area fishing boats are based. There is a morning fish market and a great seafood restaurant called Tsakiris just over the rickety metal bridge. If you are in the neighborhood this is a good place to come for lunch or dinner as it is one of the best fish tavernas in the area and some say one of the best in Greece. It is right on the beach too. Not a particularly nice beach, but a beach. 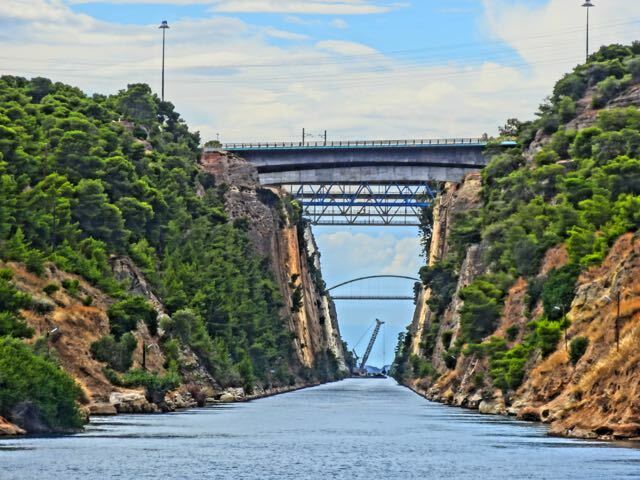 You can visit Epidavros and Myceneae with Fantasy Travel's 1-Day tour or on one of the longer tours featured on the Fantasy Travel Tours page. 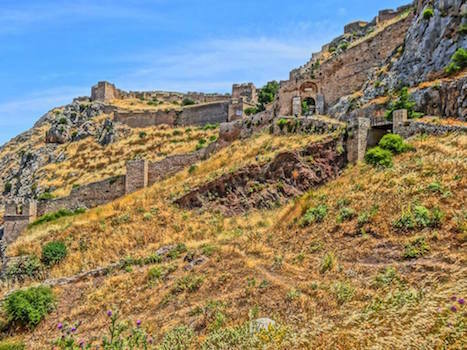 The walls of Tiryns are four kilometers north-west of Nafplio and are even more impressive than the massive walls of Mycenae. 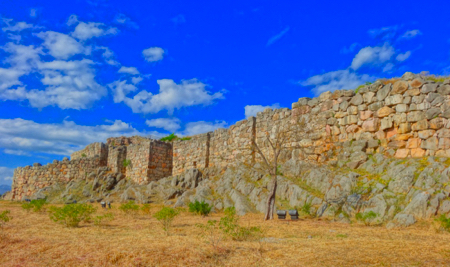 During the Mycenean era these walls defended a palace as big as the palace at Mycenae and the site has been inhabited since Neolithic times. The huge blocks which make up the Cyclopian walls are as impressive to us today as they were to the ancient people who had to drag them from the quarries and cut them up. This place always amazes me when I pass by, though not enough for me to stop the car and explore it. Just enough to take a photo from the window but finally in 2017 I stopped and took this photo. Near the village of Asini, northwest of Tolon, are the remains of Ancient Asine, including the massive walls of the acropolis, and remains of other buildings. Those who have read Seferis may remember from his poem King of Asine a description of the citadel and the fact that this King is mentioned only once in the Illiad and otherwise competely forgotten by history. 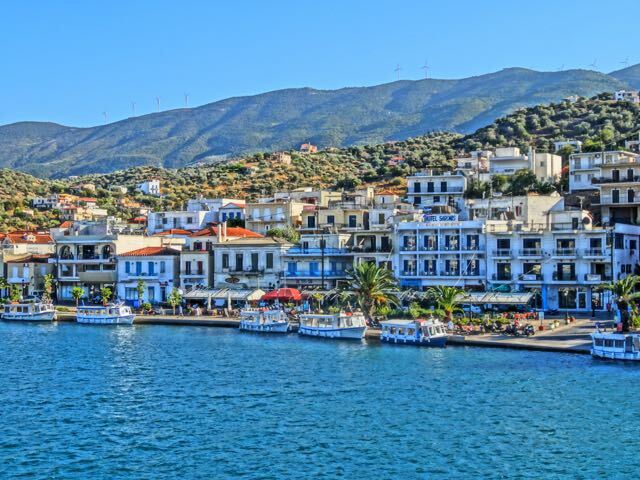 Though this tiny port is not on anyone's list of places to visit in Greece it is actually one of the best places in the Peloponessos to stop for a swim and a nice meal. This is where the small ferry goes back and forth between the Argolis and the island of Spetses, bringing supplies by truck to the village. No, you can't take your car. 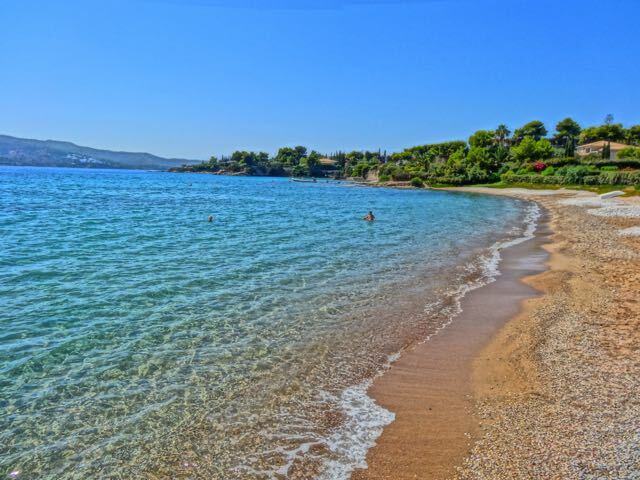 There are no cars on Spetses. If you get to Kosta between ferries you can take a watertaxi across in about 5 minutes. 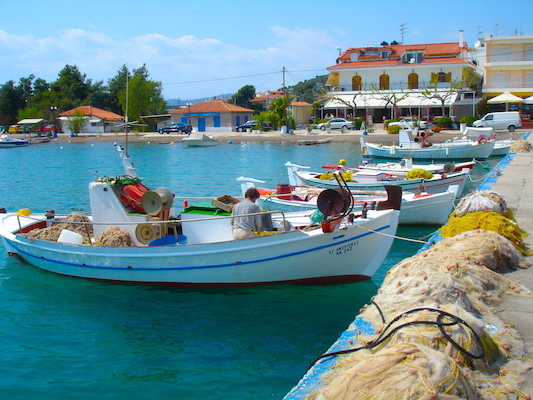 There is no realy village here, just a small port, some summer homes, a couple very large parking lots to accommodate all the cars of the people going to Spetses in the summer, a lovely beach of crystal clear water, and an excellent fish taverna called Taverna Kosta that has been here since the sixties. In 1970 my friends and I camped on the hill overlooking the beach (now a parking lot) and ate our meals here. In 2015 the boy whose father owned the taverna, was now the owner, with a son about the same age he was during our visit. No, I don't think he remembered us, though he should have. Anyway it is a very good taverna. I suggest splurging on the barbounia like we did. A half a kilo for two people is more than enough. 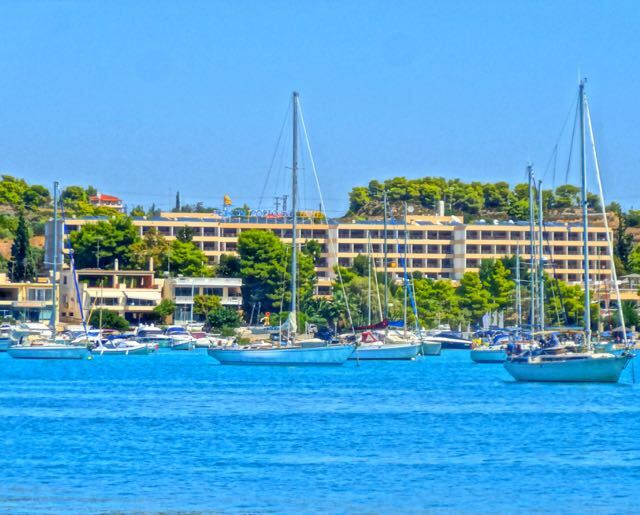 Corinth is a bustling city of apartment buildings. Its the last stop for the Athens Suburban railway from the airport. The ruins at Akrocorinth, 1900 feet above the city is one of the most spectacular sites in all of Greece and should not be missed. 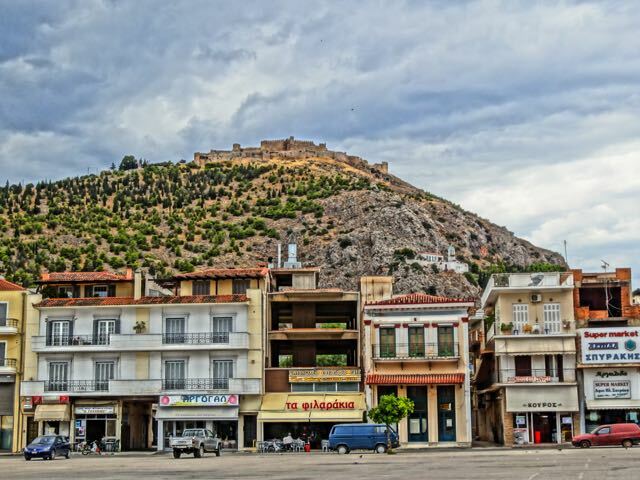 The original fortress was built in ancient times but has been added to by the Romans, Byzantines, Franks, venetians and finally the Turks and every occupying power has left it's mark. There is not much left of the Temple of Aphrodite but it is worth going up there for the view. Ancient Corinth was one of Greece's richest cities in it's heyday around the 6th century BC.due to it's position and control of the narrow isthmus which seperated the Peloponessos and the mainland and the two seas on each side of it. 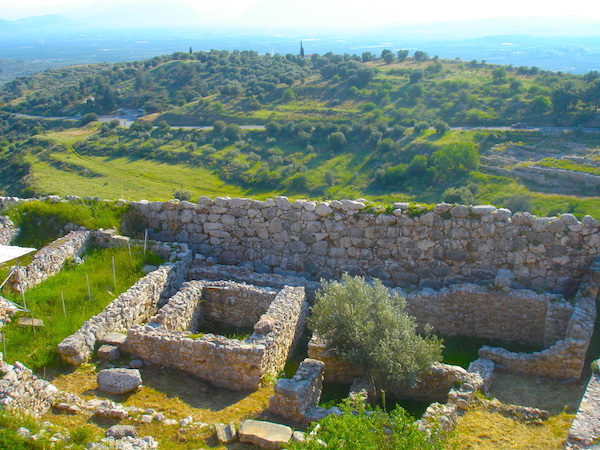 East of the modern city are the ruins of ancient Corinth, still being excavated, which feature the remains of the 5th century BC Temple of Apollo, some Roman ruins and the Lower Peirene Fountain, a natural spring that has supplied Old Corinth with water from ancient times. 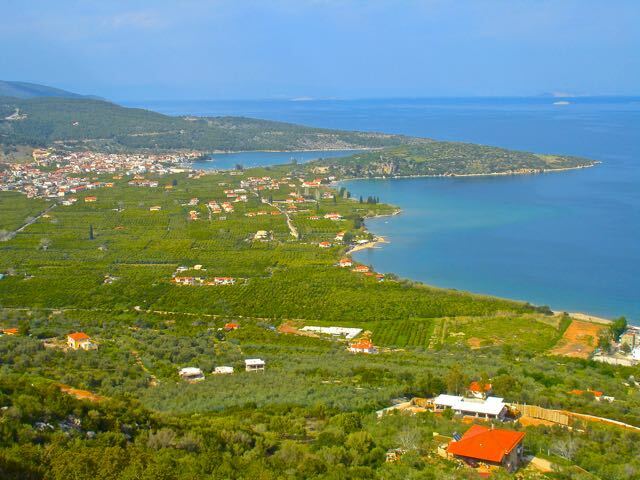 While you are here you should visit the ancient site of Isthmia as well. They have an excellent museum. 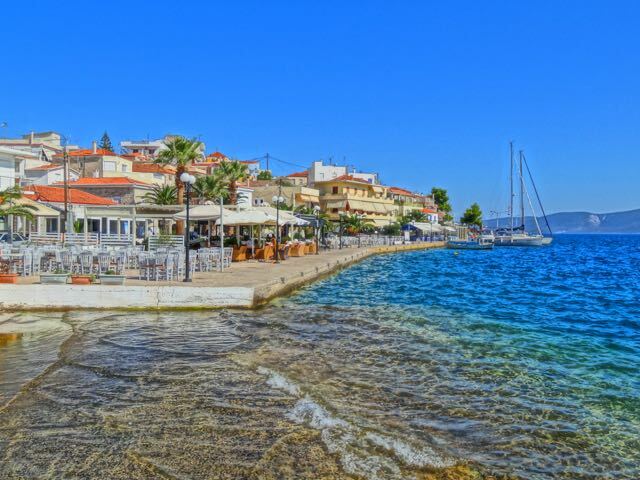 Just a few miles from Corinth is the town of Loutraki which is famous for its bottled spring water which you will undoubtedly come across during one of your meals in Greece. 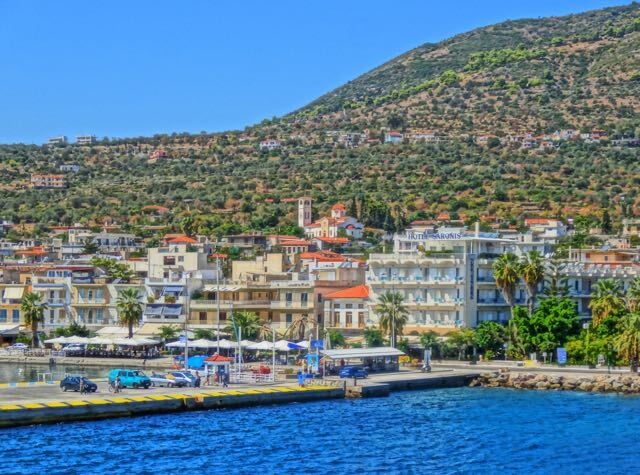 Loutraki is also known for its famous Casino Hotel where you can win or lose a fortune, or not play and just enjoy the ancient olive grove that has been transplanted on the hotel grounds. The Casino Hotel has an enormous pool and artificial waterways that snake around the gardens and it is right on the beach. In 2006 my friend George from Fantasy Travel was swimming here with his daughter when what he thought was a shark surfaced right next to him. As his life flashed before his eyes and he readied to sacrifice himself while his daughter swam to shore the creature lifted his head and looked him in the eye. It was the smiling face of a dolphin. Do you enjoy using my site? Have you found it entertaining as well as useful? 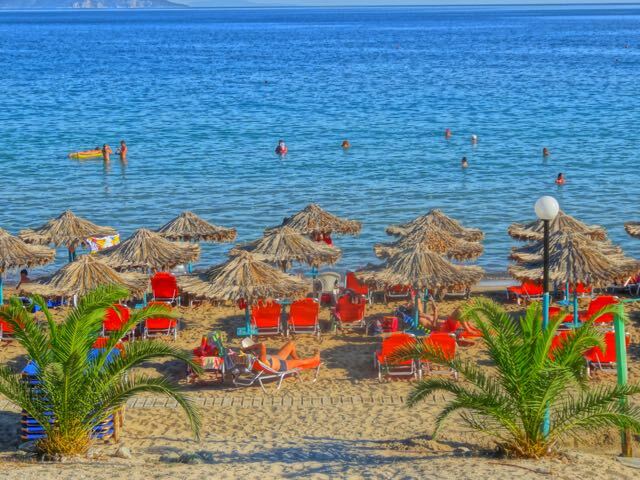 If so please show your appreciation by booking hotels through the travel agencies and the links found on my Nafplio Hotels page. The small comission I make on the bookings enable me to keep working and in most cases you won't find them any cheaper by searching elsewhere.